I had no idea until recently that John Denver wrote a song about tomatoes; “Home Grown Tomatoes,” he titled it. We hear the labels “vine ripened” and “field grown” applied to tomatoes, but this song and these lyrics remind us of how important and delicious it is to have at least a plant or two in every yard for the sake of a really outstanding tomato. I have been enjoying them this week in many ways, notably with really good cheese and grilled using the Creamers’ Jalapeno Garlic Parmesan bread. I of course always keep salsa on hand and a number of you have been asking for the recipe. For two pounds of tomatoes (which I hand slice and de-seed and then chop and drain for about 10 minutes), I add about a cup of diced tomatillos (also drained), a diced small onion (green onion is also delicious), minced de-seeded Jalapeno or Serrano pepper, a sweet banana pepper diced, a least one large clove of garlic minced (you can do all of these except the tomato in the food processor, but leave at least three-fourths of the tomatillos in pieces about same size as your tomato), and then salt, pepper and at least a tablespoon of lime juice. This salsa lasts over a week in the refrigerator and you can add more or less of anything! I have many times added chopped sweet pepper (any color), corn and even summer squash. I mostly eat it with chips, and bean tacos, but it is excellent served as a condiment or side dish with just about any dish – although gravy? I am not so sure about that. But John may have been onto something. 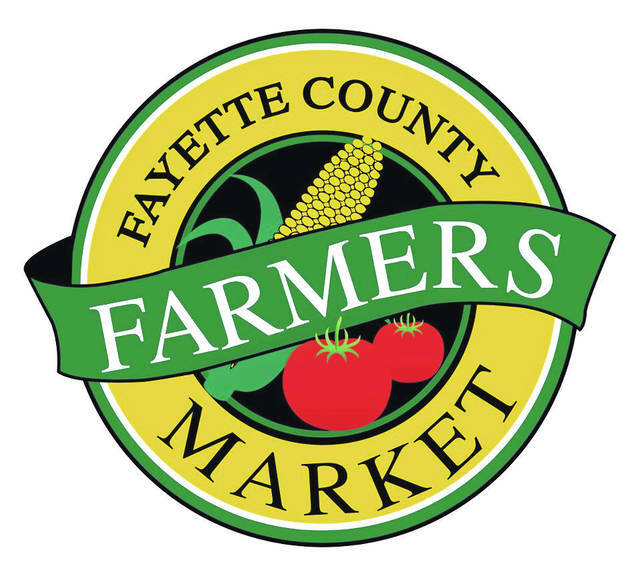 The Fayette County Farmers’ Market is open Saturday morning from 8:30 to noon and is located in the municipal parking lot on the corner of South Main and East East streets in Washington C.H. SNAP EBT food benefit cards, Senior Farm Market coupons and credit/debit cards are accepted. Those using the SNAP EBT card for produce receive matching dollar “Produce Perks” tokens ($1 for $1) for additional fruits and vegetables. So,”buy one, get one” for fruit and vegetables, up to $20 EVERY market day. Jones Farm Fresh Produce (Jon & Taylor Jones): Peaches, sweet corn, green beans, onions, tomatoes (cherry and slicing), peppers, squash, garlic, potatoes (red and blue), pork chops, jalapeño brats, sausage patties, bulk sausage, ground pork, chicken patties, chorizo chicken brats, wings, hamburger patties, ground hamburger and brown eggs. King Farms (Jeff & Sandi King): Green beans, vine ripe tomatoes, cherry tomatoes, melons, new purple potatoes, Kennebeck and Yukon potatoes, cucumbers, watermelon. Margaret’s Memories (Sharon Fulkerson): Hand made kitchen towels and cloth sets, crochet necklaces, scarves, baby blankets, bibs, doilies, felted purses and more. Persinger Cottage Foods (David Persinger and Julie Mosny): Jam Man: Texas sheet cakes, jams, jellies, peach butter. New this week: seedless blackberry jam, red raspberry jelly, no added sugar triple berry, strawberry, and blueberry. And a very limited supply of elderberry jelly. Pie Lady: Buns Bars, cini mini’s, pumpkin cookies, pecan sticky buns, cinnamon rolls and assorted fruit pies. Chilcote Farm (Bruce & Marlene Chilcote): Honey, sheet cake, blueberry buckle, caramels, and cookies. Greens & Greenery (Katrina Bush): Heirloom tomatoes, garlic, green beans, white and yellow potatoes, hot and sweet peppers, tomatillos, fresh salsa “kits” and salsa samples. Dried herbs (basil, sage, catnip, sacred basil herbal tea). Buckeyes, fudge. Cut flowers. Perennial blooming flowering plants in the rudebeckia family. Aloe plants. Katrina Bush is a vendor with the Fayette County Farmers’ Market.